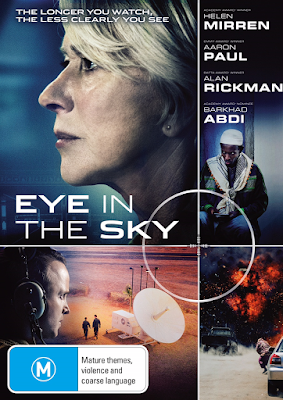 Gavin Hood’s Eye in the Sky is about a moral quandary in wartime. The film serves as an autopsy for our current love affair with drone technology, carefully dismantling a routine drone strike in order to evaluate each stakeholder in the decision making process. It craftily weighs up the loss of human life against political gain; resulting in a taut thriller, that’s constantly morphing as fresh perspectives are added to the mix. Colonel Katherine Powell (Helen Mirren) has spent years tracking some unsavoury terrorist types across the globe. Through hard work she’s finally corralled her targets under the one roof in an African hideout. So time to pull the trigger, right?! Not so fast there Quickdraw! Colonel Powell must now liaise with the wet-blanket Political-types to get final clearance. It’s here where the film truly shines; as contentious moral and strategic points are debated between various bureaucratic combatants, amidst the real-time drama unfolding on the ground in Africa. The tension is sustained through dynamic editing and a script which avoids getting bogged down in agenda. 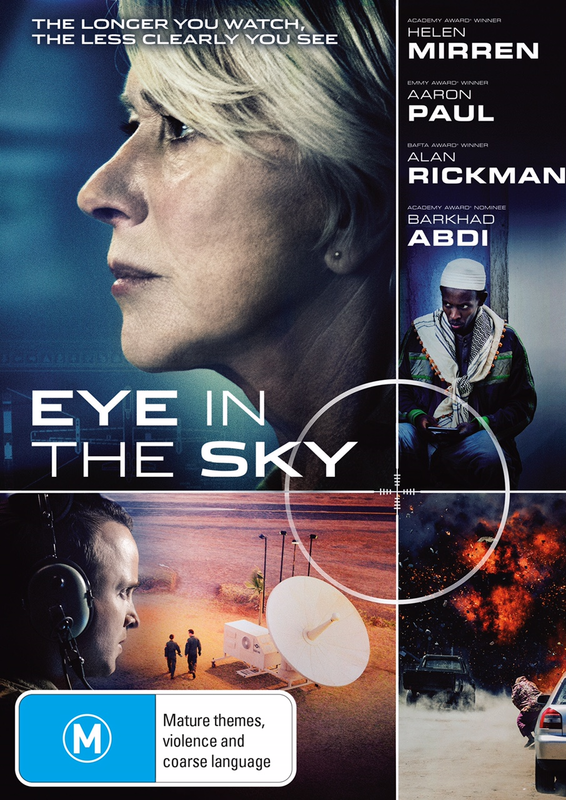 In what could have easily become a berating of military operations, Eye in the Sky presents a fairly balanced case for and against drone strikes and military campaigns in general, which speaks to the maturity of the film. On a sadder, note Eye in the Sky marks the final onscreen appearance from the legendary Alan Rickman, who passed way too soon. As he has his entire career, he fills the screen with warmth and dignity. Here he plays Lieutenant General Frank Benson, who acts as counsellor for the unhappy marriage of military action and political fallout. The film also features Barkhad Abdi (Captain Phillips), Iain Glen (Game of Thrones), Jeremy Northam (The Man Who Knew Infinity) and Aaron Paul (Breaking Bad). This is the ideal film to discuss with friends and family afterwards, just to see who in fact would or would not push the button, as it were. It came and went all too quickly from cinemas, so make sure you take the time to catch it upon its home and Digital release. Own it on Blu-Ray, DVD and Digital Download from 20 July. If you see the film and agree or disagree with my thoughts feel free to drop a line below or come over and play with us at our Facebook page.